Click here to inform me of errors. Thanks. With only construction paper, white glue, and some patience you can build these lovely shapes. First read about the general technique. Then try an easy first model. And then you are ready to choose the elaborate model that strikes your fancy. 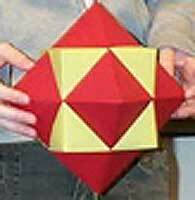 Magnus J. Wenninger's, Polyhedron Models book. You can visit Father Wenninger's site and view some of his amazing creations.